Have you ever seen a Pine Marten? Jackie our Ranger has been lucky to see them on her wildlife tours in the Cairngorms National Park. The Pine Marten is a very elusive animal. It spends it time climbing trees in search of its favourite food of eggs, insects, birds or small rodents. It also loves fruit and has been known to visit bird tables. Bilberries can make up to 30% of a Pine Marten’s summer diet resulting in its droppings turning blue in colour. Recent research has indicated that pine martens also prey on grey squirrels which are larger, move less quickly and are on the ground more often than red squirrels. Analyses is incomplete, but this could be good news for the endangered red squirrel, and many trees that are frequently harmed by grey squirrels stripping their bark. We are lucky here in the Cairngorms as the grey squirrel has not yet managed to get this far north. Pine martens have a distinctive bouncing run when on the ground moving front feet and rear feet together. They may stop and stand upright on their haunches to get a better view. 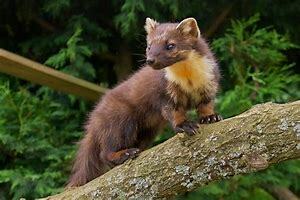 Pine Martens in Scotland where almost extinct in the nineteenth century due to farmers and gamekeepers trapping them. Their fur was also highly valued, so they were captured and killed for export across to Europe. The destruction of many of Scotland’s forests and natural habitats are another reason why Scotland’s Pine Martens have become rare today. So, if you are out on a wildlife tour there is now a much better chance of seeing these magnificent animals.